Energize your workout with full, balanced sound that conventional sports earbuds can't match. 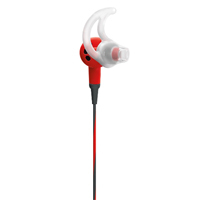 SoundSport in-ear headphones are sweat-resistant and stay comfortably; yet securely; in place during vigorous exercises. An inline mic/remote lets you easily control volume, skip tracks and take calls, all without reaching for your device. If music drives you, go further with headphones engineered to survive the demands of your busy life.